2001 Catalina 400MKII. Full cockpit enclosure with dinghy and davits. Clean, beautiful twin-helm cruising yacht. Listed at $155,000. 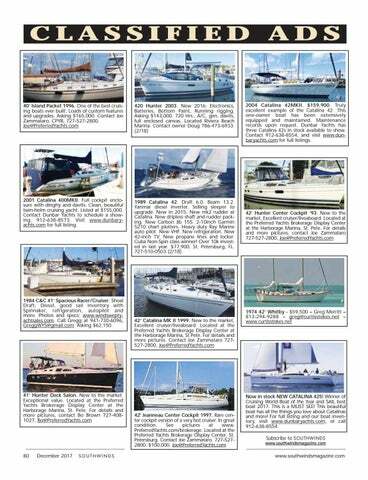 Contact Dunbar Yachts to schedule a showing. 912-638-8573. Visit www.dunbaryachts.com for full listing. 1984 C&C 41’ Spacious Racer/Cruiser. 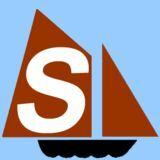 Shoal Draft, Diesel, good sail inventory with Spinnaker, refrigeration, autopilot and more. Photos and specs; www.windsweptyachtsales.com. Call Gregg at 941-730-6096, GreggWYS@gmail.com. Asking $62,150. 2004 Catalina 42MKII. $159,900. Truly excellent example of the Catalina 42. This one-owner boat has been extensively equipped and maintained. Maintenance records upon request. Dunbar Yachts has three Catalina 42s in stock available to show. Contact 912-638-8554, and visit www.dunbaryachts.com for full listings.